So we’re about one month into our niche site duel (since I was challenged), and things are starting to move. I’ve posted the latest updates from the other participants on the niche site duel hub, so I definitely recommend checking that out because there have been a lot of recent updates and a lot of excellent content to take in. August 25th: Site went live. Not ranked. The crazy thing is that I’m already on the first page of Yahoo (#8). I did some research, and this is probably because Yahoo has a totally different algorithm and weighs backlinks a little differently than Google does. I already have quite a few backlinks (I’ll explain this later), so this could account for the position in Yahoo. Google is where it’s at though, so there’s no reason to stop here. The rapid climb in Google is a good sign that Google is indeed crawling through my website regularly and finding a bit of value in it. As I add more content and create more backlinks, I will climb even higher. On a side note, when you start a new site and are finally picked up by Google, your ranking could do what people refer to as “The Google Dance.” The Google Dance is where you bounce around the rankings like crazy, until you’re finally put into a stable position. One day, you might be ranked, and the next day, you’re off the radar. Then, you come back, only to disappear once again. If this happens to you, don’t worry. This is Google trying to figure out where to place your site, and as long as you keep creating unique content and continue to work on backlinking, you’ll usually come back even higher than you were before. I have yet to experience the Google Dance myself, but I know a lot of people who have, so just be aware that this could happen to you. As I mentioned before, the strategy I’m using for this particular niche site (which is about security guard training) is a bit different from the previous niche sites that I’ve done. The reason is because I want this site to grow into an authority site and essentially become another GreenExamAcademy for me, which as you know was my the first site I created that taught people how to pass an exam in the architecture industry. It worked once, so why can’t I do it again? Although the industries are obviously different, the goals for the sites are fairly similar: give people the easiest route to advancing or starting their career. And even though it’s taking me a bit longer to get on the first page of Google and earn money from this site (compared to my existing niche sites), I am finding this to be a lot more enjoyable. The content is more interesting to me, and I feel good about possibly helping people out. Create content that people would find useful and helpful. Create content that helps me rank higher in the search engines. An excellent and very fair question. When I created GreenExamAcademy.com, I also didn’t anything about that particular exam either, and because of this, the content I wrote on that site was perfect for someone who didn’t know a thing about it, because I didn’t either. As I found out new pieces of information, I was able to easily translate it in a way that any beginner could understand. This is something I know I’m good at, which I hope you can tell by the content I publish on this blog. In Made to Stick by Chip and Dan Heath (full disclosure – I earn a commission if you purchase), they talk about something called “the Curse of Knowledge.” This is the “curse” people have that makes it hard for them to teach something they know to a person who knows nothing about it. It can be tough to gauge and hard to assume how much your pupil already knows. Since I don’t know anything about the subject, as I do the research, it will be easy to translate it into something that people can easily consume. At least this is the idea. So, what I’m doing is putting myself in the shoes of someone who may eventually end up on my site, and providing them the content that I believe they want to see. The only problem with this strategy is that if this is all you do, you’re going to be missing valuable pieces of information on your site. You are just one person and you can only assume so much about what you think a visitor might want to see. This is why it’s important to go one step further. Find out what else people are searching for. Write content about those topics and rank higher in the search engines. The truth is, if you stick to just creating content around your primary key phrase, you’re not going to go very far. Google loves relevant content, specifically targeted at keywords related to your niche that are both derivative and semantic. I touched on those terms in my Keyword Research Webinar (free replay), but basically you need to write content that targets phrases that relate to your primary key phrase that include your primary key phrase (derivative keywords), and phrases that relate to your primary key phrase that do not include your primary key phrase (semantic keywords). For example, if you have a site that is crafted for the primary key phrase freshwater fishing reel, a derivative key phrase that you could also target as a secondary keyword could be: best freshwater fishing reel, or freshwater fishing reel tips. A semantic key phrase that you could also target as a secondary keyword could be Abu Garcia spinning reels, or lightweight baitcasting reels. Google will love a site that contains a good mixture of content around your primary keyword, and both derivative and semantic keywords—mostly because it looks more natural. There are several ways to find both derivative and semantic keywords for your niche site. Obviously, the thing that I like to do is use a tool like Market Samurai (free trial – full disclosure – I earn a commission if you purchase)), which pretty much does the work for you. But, as always, I want to show you how you can do it for free. 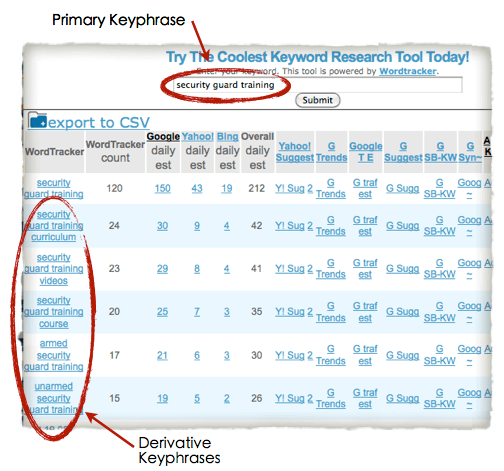 An easy way to locate derivative keywords is to use a keyword research tool such as the Google Adwords Keyword Tool, or the SEOBook Keyword Tool. Enter your key phrase, and it will spit out a number of terms that people are searching for which include the key phrase that you typed in. You could also simply type in your primary phrase into Google, and see what words come in after it. This used to work really well on the Google homepage (when Google would try to guess what you’re searching for), however since they recently rolled out Google Instant and the results for your search come up before you even finish typing, it makes it a little harder. To find semantic keywords, you could try this “sneaky” little trick that I’m guessing you didn’t know. If you did, then kudos! All you have to do is insert this symbol: “~” (the tilde symbol, usually located to the left side of the “1” on your standard keyboard), before your keyword. This symbol tells Google to search for synonyms of your target keyword, and they show up bolded in the results. Brackets on the outside to make sure Google knows to find synonyms of that exact phrase, and a tilde (~) behind each word so that Google knows that each word is taken into account. Anyways, it works. 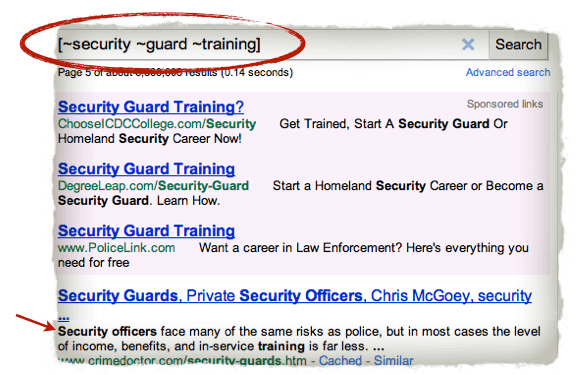 When I did this search in Google, I found the words security officers, bodyguard training, safety, certification, protection training, and firearms training all bolded in the results. Tip #1: If you used the advanced search option, you can list up to 100 search results at a time and get an entire list of semantic keywords and synonyms all at once. Tip #2: After you make a list, I’d put those terms into a keyword research tool just to make sure those aren’t dead phrases that should not be targeted. They usually are okay, but just to double check. While doing research on my niche, I found out that every single state in the US has a different requirement or prerequisite before one can become a security guard in that state. I only found two websites that list each of the requirements state by state, which are both hard to navigate and full of errors. None of these sites were ranked in the top 50 in Google, so I really have an opportunity to put something useful out there for people. What I’m in the middle of doing now is creating a separate blog post for the requirements of every single state. I think this is what I have to do if I want my site to actually be useful, or else someone from a random state might get the wrong information. Although this is a lot of work, I think this is good because it will add relevant content to my site (with derivative keywords that people are indeed searching for, such as security guard training in California), and it creates new pages which could rank high in the search engines as well. I could even take it a step further and include YouTube interviews from security guard training facilities in each state that go over each state’s specific requirements, in exchange for a mention of the training facility on the video and on the blog. I could post these onto YouTube, embed them onto my blog, get traffic from YouTube and possibly get ranked in Google for those videos (for those derivative keywords) at the same time. 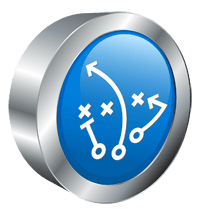 Plus, this would introduce me to some training facilities that I could possibly collaborate with in the future for affiliate offers, advertisements and product sales. I like this plan, because it gives me clear direction and I can literally create a checklist of items to do and check off as I go. Yes, this is a lot of work, but like I always say, it’s about putting in the hard work now, so you can reap the benefits later.  As I’m creating this content, I’m always working on creating backlinks to my site which I had originally planned to talk about in this post, but I didn’t realize I had so much to say about content. So, on Monday I’ll post about my backlinking strategy for you. Maybe by then, I’ll have climbed even higher. So what do you think? Am I taking the right approach, or just wasting my time? I’d love to hear your thoughts on this, and constructive criticism is genuinely welcome. As I mentioned before, Tyrone and I aren’t niche site experts, but we’re making this challenge public so everyone can learn from what we do – both from our successes and from our failures. I hope you enjoyed this, and thanks for your interest in this Niche Site Challenge. Have a fantastic weekend! Cheers!